Keep an eye on your thistle feeder! Those little birds feeding greedily may not be the American Goldfinches (Spinus tristis) that we thought they were. Just as in 2015, the Pine Siskins (Spinus pinus) rode the icy north winds down from Canada into Oakland Township. Some years they come; some years they don’t. Cornell Lab of Ornithology refers to them as erratic migrators who range like nomads across the continent each winter, foraging for seeds. 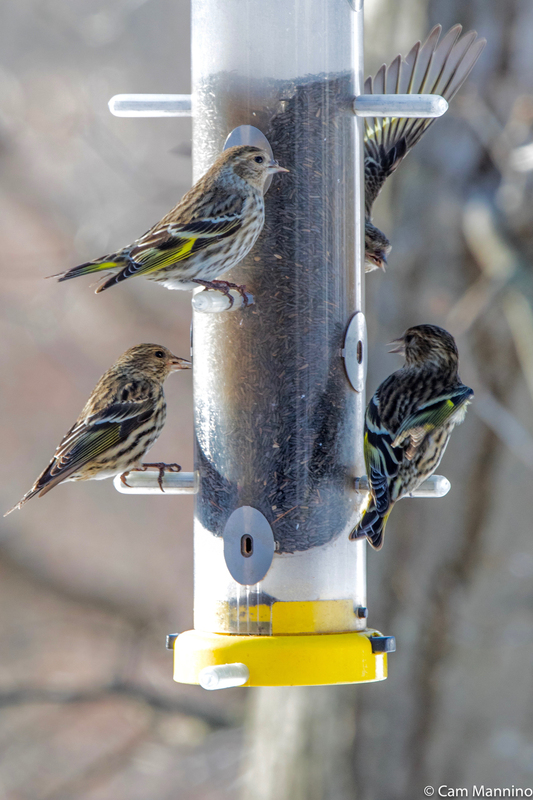 Your finch feeder and mine are just the ticket to attract these wandering birds. The Goldfinch (upper left) with its clear breast weighs the competition from another Goldfinch (center) and four Pine Siskins. The female House Finch’s bill is thick, and she has no yellow feathers. Pine Siskins have fine, sharp bills and yellow wing feathers. So enjoy these feisty little travelers while you can. You never know where they’ll spend next winter! Thanks, Marit! Great little bird, so it was fun to try to capture it in photos.